Five years ago right now, my cancerous kidney had been removed and we were preparing to begin interleukin on April 2. That means my upcoming semi-annual CT scan, here in 2012, is a biggie: the five year one. Among other things, lots of studies record the patient’s status five years out. But I have a problem – a big one. On my $10,000 deductible insurance, my scan last fall cost me $1,736, and I’m not sure another one will be worth that to me. I later found out she’s wrong – misinformed, answering a question without being trained about it, or whatever. My point here is simply: look what happens when someone tries to help improve our out-of-control US health costs. A key factor is that this is the only industry where you have to pay for something without line-item detail. I mean, can you imagine checking out of a hotel (or auto repair) and getting a bill for $1,736 with no line-item detail?? So that makes me ask, how did that happen, and how do we fix it? For my part, I’m going to ask and keep asking, and not take “nobody knows” for an answer. So I decided to dig. As my next scan approached, I wrote to my oncologist, saying I wasn’t sure if I would do it. He said he’d prefer to have the data but he’d understand if I felt I couldn’t afford it. He pointed out that it’s the five year one. I decided to find out what my options are. Could I get it done for less? Someone pointed out that my hospital offers discounts for people who can’t afford full price or don’t have coverage. So I had to talk to the hospital itself to learn about such discounts for the “facility charge,” and another group (in another city) to learn about discounts on the “professional fee” (physician charges). Long story short, each told me I’m not nearly poor enough. (I’m nowhere near poverty, which those discounts require.) I don’t mind being told that, but note that the people who told me to explore discounts didn’t note that requirement. So it took me four phone calls, with tag, to connect with someone who did know. Side note: I half-expect to be told that this is wrong, and such discounts do exist for self-pay people like me. If so, it will bolster my point: the people I talked with didn’t have the right information. Disempowering. To comparison shop, I need to know the shopping list. The insurance company literally didn’t know what was on the EOB, so they couldn’t tell me. They said I could only find out what the line items were by contacting my hospital. That’s fine for high-level detail, but there’s obviously no way to check it for errors (e.g. wrong insurance codes, services that didn’t actually happen), nor to explore what another provider would charge. So, the engaged / activated consumer has more work to do. Side note: I will put “EOB” in quotes until the day when the damned thing actually explains anything. As I said in that November post, I believe the FTC should prohibit calling something an explanation if nobody can understand what it says – not even the people in customer service! It turns out the 15 line items break out into four categories: the scan itself, the radiologist who reads it, the bloodwork needed before the scan, and then the meeting with my oncology team to review it. To comparison shop, I need to know, apples to apples, what I’m buying. (Buying? Yes, buying. Like a consumer.) I never did get anywhere near the level of detail I want, but in the process I learned enough to know what I’m going to do. Here’s how it went. I called NHHP, and they don’t know either. Yes, folks, both the vendor and my insurance company say they don’t know. That’s how I found out that the company I call (the number on my card) is not the actual one that negotiates prices with providers – the number I have just does the billing. No wonder the person I first spoke to, last fall, had no clue about the line items. She (and the better-informed supervisor I eventually found) have no access to the information. It turns out the business relationship with the doctors is actually through another company, American Healthcare Alliance. They negotiate the prices; the bill for a service goes to them. They apply their negotiated discount, remove the description of service, and pass it to the people who print my EOB. I left a cheery voicemail reminding her that her recording’s out of date, and called back to Ms X’s extension for immediate assistance. I left a message at 10 a.m. No call back yet. Mind you, I can’t fault the company too much – they obviously don’t have great phone customer service practices, but I also know they’re not at all accustomed to people like me calling with questions like this. Still, this is what happens when a consumer tries to help control costs. Items 2 & 3: CT scan and radiologist: The bulk of the cost – $945 last fall – was for the scan itself. Then there was another $290 for the radiologist to interpret it, total $1235. Add the $248+ of lab fee = $1,484 so far. I know there are independent radiology shops – some advertise on TV – but I wasn’t looking forward to the research, because there’s nothing (yet) that remotely resembles the comparison sites we see for travel (Orbitz, Travelocity, or my favorite, Kayak.com). Yes – the separate charges for lab work – $248 via insurance at my hospital or $347 from Quest? Included in the $520. So, woah: now we’re down from $1,484 to $520. It’s not a fly-by-night shop or cheapo; they’ve been in business since 1975, and seem to be continuously updating their equipment: “We’re proud to have been the first provider in the region to offer our community digital mammography (2004), 64-slice Cat Scan (2006) and 3T MRI (2009).” But they’re a retail business – no captive market, so they work to earn your business, with pricing designed for consumers like me. Imagine that. Healthcare operating like a consumer business. Will you fault us for trying to get care (being engaged, “compliant”), doing the hard work to find it at a price we can perhaps afford? Will you help? For my part, I also have this skin cancer to remove (probably thousands), plus $3800 for unrelated dental work this month. And optical costs for my high intra-ocular pressure, which, if not tended to, could become glaucoma. All of those are more urgent – at the moment – than a five year follow-up scan. So here is the bottom line: the world is changing, now, and it’s going to hurt bad for some people, and create big opportunities for others. Some will start to say “It’s my damned money,” and declare their own terms, issuing an RFP. As word gets out that prices vary this much, it’s going to get very unhappy for the people who can’t justify higher prices. Note: as in every industry, when this happens you can’t fault the people who’ve been high priced: they mostly didn’t set out to be that way. But it hurts when the change hits; I felt it when desktop publishing hit typesetting. Get ready for it. I’m very, very concerned for the wonderful people I’ve met who work in those institutions. Consumers who start shopping will create a great demand for websites that aggregate different vendors’ prices – and, for radiology, the quality of their equipment and software. Travel sites tell you what type of airplane you’ll get, and their on-time performance. Watch for this in healthcare. Tripit.com finds my confirmation emails and imports the schedule info (so my wife can view it on her Tripit app), then publishes it all in a Google Calendar that I can see on my phone. FlightStats.com connects to Tripit and looks up gate information for my flights, in real time, even if the gate changed while I was in the air. Addition, 9:30 p.m. – forgot it earlier! : This will be a very big opportunity for providers who switch to transparency. As in any other industry that gets truly disrupted – and I don’t mean upset, I mean disrupted, in Christensen’s formal definition – the dominant incumbents will deny that it’s happening, deny that it’s even possible. But a rapid increase in information liquidity – free flow of information, in the new ecosystem – will mean it’s much easier for new solutions to get noticed and to succeed. The new world is starting to arrive, folks. I was about to walk away from a scan that, honestly, I would prefer to get but couldn’t afford. Now I probably will get it. But I reached these results without a shred of help from the insurance industry … and with help from new-generation players. We must take matters into our own hands, while demanding that industry – providers and insurance alike – give us a hand. Let Patients Help! And innovators, have at it. Pounce. We need your help. Dave, what a great example of something we can do. I was also struck by the price sheet you posted. Three years ago, I had to get a simple routine chest x-ray for a work permit while living in Barbados. While here in the States, I got the order from the doctor and went to the hospital (where they sent me) to have it done. The cost? A whopping $500! Now, at the time, that was covered by my insurance, but that’s not really the point. I also live in a much smaller rural area than where you are. What a vast difference in pricing. It’s time we stand up to these kind of practices and do what we can to control costs in health care. This is a great story of one person doing just that and one I hope we see replicated in the industry. Dave, absolutely great sleuthing! A point you didn’t mention: The dastardly insurance business will hose you from the backside as well: your expenditure will likely NOT attribute toward your deductible since you’re self-paying. Hmm, did you use to be in the typesetting biz? I’m a former graphic design pro who still utilizes all those skills; I “desktoped” as soon as Apple released a modular Mac, the Mac II, in ’87. I may still have my old hand waxer! Yes, I was in typesetting. Actually, Bart, I’ve had no bad experience at all with NHHP denying anything. 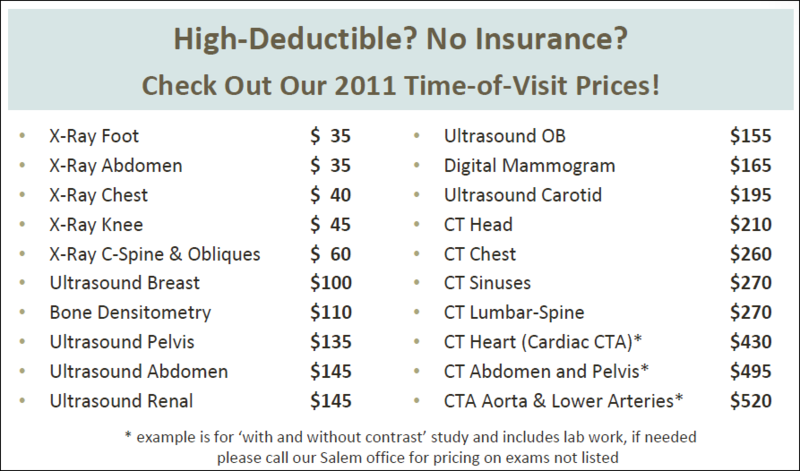 And I’m being careful that everything DOES go through insurance, so it counts against my deductible – note that the Salem Radiology piece talks about high-deductible and self-pay. My only complaint with them is that it’s really hard to reach someone who knows what’s going on. Now that I understand that they’re not in the BUSINESS of knowing it – they’re only a blind bill processing office – I see that differently. I do fault any office that says “for immediate assistance” and has no provision to make it happen. That’s just sloppy and/or uncaring. But NHHP has not done me wrong. It’s just been hard to get INFORMATION, but as I say, I’m sure that’s because they’re not accustomed to RECEIVING these questions. I wouldn’t be surprised if some policies are like that. But in my area I’ve been told for years that the key is to have them SUBMIT IT so it racks up against my deductible. I do need to check one thing though – last year’s $1736 is not showing up on my current deductible year-to-date. I only started that insurance in September; did they reset it at January 1?? I need to find out. Of course, since it’s not really a consumer retail business yet, they don’t have customer service on weekends. And I can’t email them. So it’ll be a (short) call from Europe. Hi Dave – We’re high deductible folks as well. And I’ve learned a bit (the hard way) about informed shopping, which is a challenge if you don’t speak the lingo. You can’t get an answer if you don’t know what to ask. Anyhoo – love the BlueBook; off to shop for a colonoscopy. I think I’ll add an MRI for my knee and maybe some dermatological stuff. Hmm . . . maybe I’ll get my hubby a crown for Father’s Day. Hugs from the sunny southwest. Wish you were here. You are only tilling the very surface of the soil Dave. Thanks for the archeological dig. More will be revealed. Just look at the fight against ‘standard benefit’ or minimum thresholds of covered services, not to mention the ‘threat’ posed by insurance exchanges to make comparison shopping even possible. BTW, let’s call them what they are. They are not insurance companies. They manage precious little risk other than of the actuarial and underwriting type. They are transaction processors. Watch how they fight to redefine what qualifies for MLR (medical loss ratio) expense so they mitigate the need to ‘reimburse’ or refund excess premium charged. Once you’ve seen on schedule of insurance, you’ve seen one. Nice report. Proving, once again, that ePatient Dave is a national treasure! Also proving that the Salem N.H. radiologist is emblematic of a growing trend: Patients want this information, and increasingly providers are making it available. We think that increasingly such transparency will bring competitive advantage to such forward-thinking providers. We’ve been collecting prices in New York City and are finding that variations of 10x in this area for cash or self-pay patients are not unusual. We’re about to re-launch the site — come on over to http://clearhealthcosts.com/ to check out our prices, and stay tuned for more fun! We would love it if you would sign up to beta-test our re-launch. Oh, yes, and did we say: ePatient Dave is a national treasure! You have done a remarkable job researching this, and it appears that your efforts will pay off with getting the recommended scan at a reduced price. It is unfortunate that all this takes so much effort. My only contribution here would be related to the need (or lack of) for the follow-up oncologist visit. Your oncologist may be hard-pressed to argue that an office visit adds much beyond reviewing the scan results. They likely would appreciate knowing that you have not experienced any recent worrisome symptoms such as back pain, unexplained weight loss, or urinary symptoms. Labwork may or may not be helpful in your situation, such as a urinalysis. Getting the scan and sending them a brief message of your current status may be all that is needed. Of course, this approach does not in any way compensate the oncologist for the service of reviewing your situation, which is not really fair to them. However, it is also not really fair to you if an office visit results in a $250 charge to simply review your scan, ask a few questions and perform a minimal exam. There is the possibility that such a follow-up visit would not be less expensive than you predict, but I doubt anyone would be willing to commit to providing you a definite price. You call attention to significant barriers to patient engagement/empowerment. The system is complex, providing no quick or easy solutions. Thanks for taking the time to share your experience and frustrations. In the big picture, we are glad that you are around to be annoyed by all of this. Hi, i feel that i saw you visited my blog thus i got here to return the choose?.I’m trying to find issues to enhance my site!I suppose its adequate to use a few of your ideas! !